Audiobus is a genuine game-changer. Hopefully some sort of MIDI sync setup and the ability to save setups are on the way, but as it stands, this a truly essential app for any iOS musician. It works! Lots of developers onboard. Holds huge potential for iOS music-makers. No MIDI sync. No ability to save setups. After much pre-launch fanfare, Audiobus is finally here, bringing inter-app audio streaming to your iOS device (it's Universal). 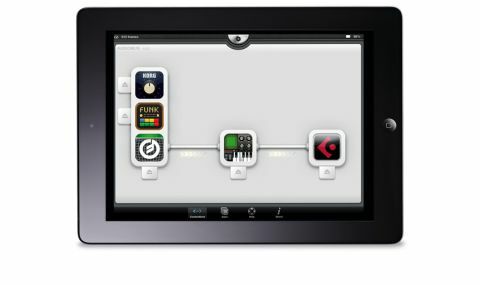 "The apps have to be made Audiobus-compatible by their developers, but A Tasty Pixel has done an amazing job of getting the industry involved"
The idea is simple: load up to three sound-generating apps, and/ or an app to process it/them, and/or an app to record the final mixed output. The apps have to be made Audiobus-compatible by their developers, but A Tasty Pixel has done an amazing job of getting the industry involved - everyone from Moog and Propellerhead to Steinberg and Korg seem to be quickly getting onboard. Quite simply, Audiobus works exactly as advertised, enabling you to record your iOS instruments - or an external input, such as another iOS device also running Audiobus - into the likes of Cubasis, MultiTrack DAW, etc. Moving between apps is done using an omnipresent switcher bar, and loading them is managed from within Audiobus itself.